More Azure in the TFS vNext (2015) and no more WF in Builds Alleluia ! But yes, I know it is not considered as to be a “Best Practice” since it is not written as Workflow Foundation DLL that extends Build Process Templates ? Now, in 2015, guess what ?? Yes, Scripts are back !! I was so pleased when installing TFS 2015 (CTP) where Builds were identified as “legacy” !! and yet also anxious, since it means throwing away a large amount of previous knowledge ! Now re-order the Steps as you wish. No more complex parallel crazy workflows that spans across multiple pages that crashed my Visual Studio, yet having a powerful configuration. No more multiple pop-ups (like the old ones). Everything is accessible rapidly. To configure the Agent with infinite extensible capabilities ! HOW TO USE THE SERVICE HOOKS ?? For instance, when a TFS event raises (exhaustively : Build Completed, Code pushed, Pull request created, Pull request updated, Team room message posted, Work item commented on, Work item created, Work item updated). Ability to add a deployment environment. Interviewed by a journalist : How and why Microsoft Azure spreads in our company ? “ Thanks to the Microsoft cloud platform Azure, VISEO has the network & compute power, as well as the storage capacity necessary for running rapidly it’s customer’s applications. 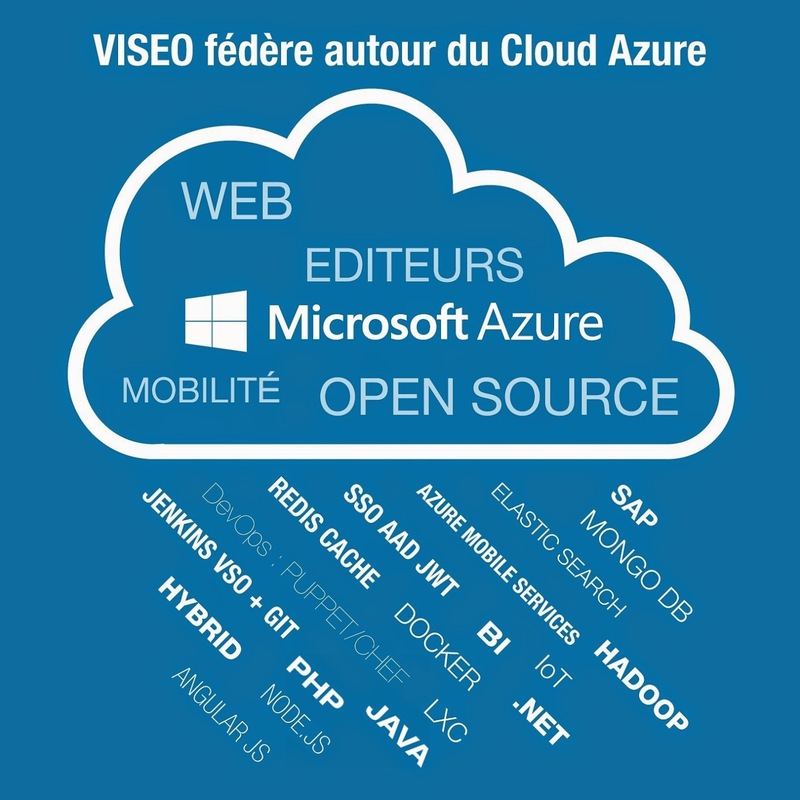 Due to difficulties to dimension the servers to meet the customer’s needs and to develop new projects, VISEO decides at the end of 2013 to migrate to the Microsoft Azure. A “per-usage-billing”, the platform offers by default a broad variety of servicesand allows the usage of many programming languages or can host 1/3 parties applications. In one year, VISEO tipped 30% of its servers on Azure. At the end of year 2015, 70% of the resources will be on Azure. Colibri, an SaaS application 100% running on Azure PaaS have been certified complyant to the Azure Active Directory standards. Hence, after few weeks of evaluation and tests by Microsoft Corp teams, the team is pleased to annonce that Colibri is THE FIRST application in France (and top 50 worldwide) that integrates Azure Active Directory SSO principles (i.e. not the password-only safe). During the TechDays 2015, Paris (18 000 visitors), Microsoft France chose to present it during a return an experience session. The Product Manager and I were present to answer any questions. It is a collaborative tool that revolutionize sales forcasting. It fills the gap between expensive SAP or Microsoft Dynamics solutions and an Excel file ! It is entirely designed for Microsoft Azure fron the ground up, offers a full reversibility to allow an install on-premise. Presentation during the TechDays 2015, in Paris. I'm glad to be part of one of the largest global event with about 10 000 attendees worldwide and over 120 cities hosting this FREE event. 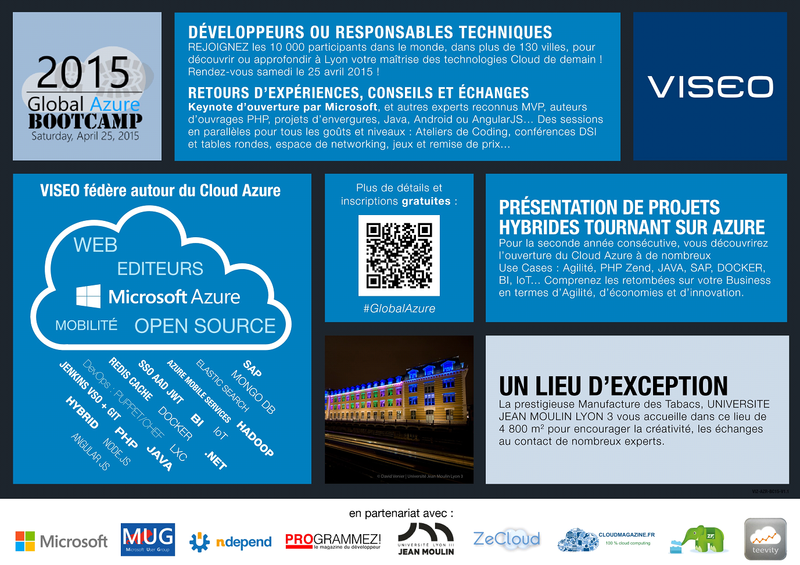 I’m in charge again in 2015 of organizing this in Lyon, on Saturday, April 25, 2015, thanks to my company VISEO and my association Microsoft User Group and with the help of Microsoft France.